Governments must cope with the enormous uncertainties about both future climate change as well as the costs and benefits of slowing climate change. This study analyses the value of improved information about a variety of geophysical and economic processes. The value of information is estimated using the "PRICE model" which is a probabilistic extension of earlier models of the economics of global warming. The study uses five different approaches to estimating the value of information about all uncertain parameters and about individual parameters. It is estimated that the value of early information is between $1 and $2 billion for each year that resolution of uncertainty is moved toward the present. We estimate that the most important uncertain variables are the damages of climate change and the costs of reducing greenhouse gas emissions. Resolving the uncertainties about these two parameters would contribute 75 percent of the value of improved knowledge. 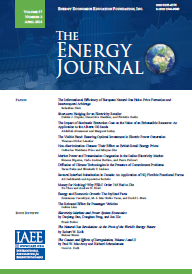 Published in Volume18, Number 1 of The Quarterly Journal of the IAEE's Energy Economics Education Foundation.